August | 2015 | My Year Away. And Back. What Do the Monkees and Politics Have in Common? Reading Believer, it was easy to sense that this guy likes to be smack dab in the middle of the hubbub. I get that. But what I loved best about this book was the way Axelrod, by writing his autobiography, explained the significance of politics, the difficulty of doing the right thing, the necessity of making compromises and the importance of keeping an eye on the big picture. He writes this with a kindness and appreciation for those around him that I found downright inspirational. I don’t really think of myself as all that interested in politics. I’m not registered as a Democrat or Republican and rarely vote a straight party ticket. To my liberal friends, I seem quaint and sorely conservative. To my conservative friends, I am liberal—or at least, misinformed. Even though I might not consider myself political, I’ll admit I’ve binged-watched West Wing twice on Netflix and cried both times when President Bartlett (my president) says good-bye to his loyal staff. I am intrigued with Tea Leoni’s Madam Secretary, and I was one of the few devotees to Geena Davis as president on the short-lived Commander in Chief. These TV shows, all smartly written, give an inside view to politics in Washington. But Believer does something more. It quietly shows the dedication and sacrifice demanded from our public servants. Say what you might about President Obama, this book demonstrates in no uncertain terms that our president has worked hard for the country. Axelrod doesn’t put the president on a pedestal; instead, he gives a careful, honest, and meticulous accounting of the president’s achievements as well as his shortcomings. Axelrod assembled a large fact-checking team to work through the nearly 500-page manuscript. It pays off. There are well over 300 reviews on Amazon and most reviewers give the book five stars. Just a handful (fewer than 20) criticize it; a few die-hard partisans even call the book “fiction.” Give me a break. While the majority of the book relates to Axelrod’s work with Obama, there is also keen look into Chicago politics as well as the author’s early years as a journalist. Through it all, Axelrod carefully points out that making a lasting difference is hard—but worth it. Though my impact on journalism education may be miniscule compared to Axelrod’s impact on politics, his reflections resonated. Maybe it’s because we’re the same age, have been married to our first mates for the same amount of time and even have a grandbaby the same age (although mine is cuter). Or maybe it’s because what he depicts in his book is really about life, albeit seen through the eyes of a consummate politician. And now, I head back into my own little political world: the academic life. But rather than distain the obvious (honestly, how it is possible to have a two-hour faculty meeting and make no important decisions? ), I’m going to be a believer. In the immortal words of my favorite band from childhood (the Monkees, of course!) “Not a trace of doubt in my mind…I’m a believer.” Thanks, Axe. Categories: Book Reviews | Tags: Believer, David Axelrod, Monkees, Obama | Permalink. As you’ve read elsewhere, I’m rather enthusiastic when it comes to rowing. So it should be no surprise that one of the goals on my sabbatical “to do” list was to go to rowing camp. This would be my fourth time to attend. The schedule is simple—but grueling. 7 a.m: First row (coffee only). 9 a.m: Breakfast (lots of food; it’s the most joyous eating experience ever). 11 a.m: Video review of the morning’s row (always revealing). Noon: Mid-day row (painful. Hot. Tortuous.). 2 p.m: Lunch (starving! Pass me another!!!). 5 p.m: Evening row. (I can do this). We do this for four days. While I work on my whole stroke during camp, I was particularly interested in improving my oar handling this time, which meant I focused on how my fingers rolled the oars up to the catch (the point at which you gently unweight them, grab the water, and then push!). 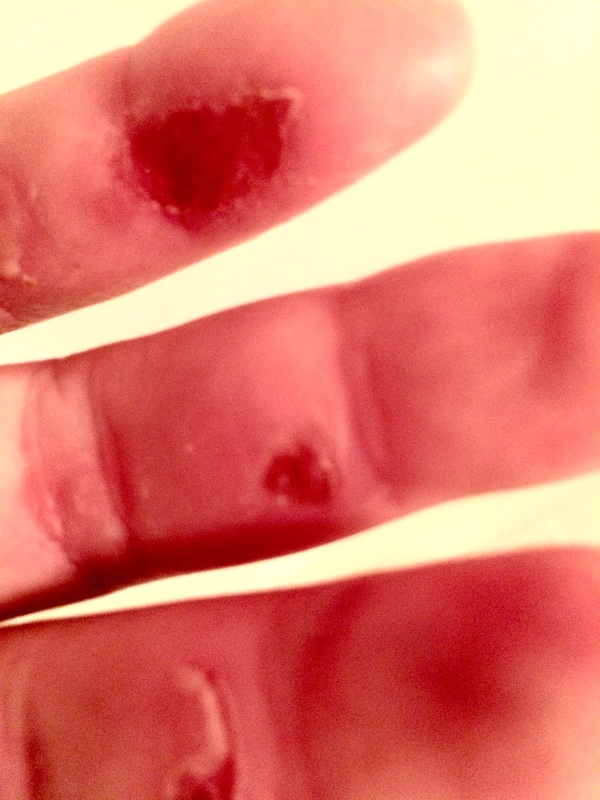 With about 27,000 meters of rowing each day, it wasn’t long before my hands were a bloody mess. And this was just Day 2 of Rowing Camp! I went to camp with seven other of my Beaufort Rowing friends. One is my age but the rest are between 10 and 15 years older than me. I am competitive enough to know that I wanted to make sure I did more than the older rowers—and complained less. This was harder than I expected. More than once I was ready to throw in the towel and sit out a row. But my friends wouldn’t give up. They did everything the coaches said. They listened. They laughed. They tried new things. They encouraged others. And, they also got better at rowing. Simply put, they were amazing. I’m back at home in Columbia now, savoring the last days before the semester begins (in a matter of hours, actually!). I rowed yesterday morning with these rowing friends. They were all a little sad when they realized that this was my last mid-week row at the beach. It’s back to the lonely sculling life in Columbia during the week with only Saturday morning for Beaufort rows. I was touched my friends were sad. I was sad, too. Aristophanes said, “Why, I’d like nothing better than to achieve some bold adventure, worthy of our trip.” I’ve been on a lot of bold adventures during My Year Away. (I mean, I did go ziplining through the rain forest.) I’ve travelled the world and I’ve seen a lot of mind-boggling sites. But one of the very best experiences I’ve had this year was to spend four days with my rowing buddies. I am fortunate to have great rowing friends, a couple of best girl friends, a fantastic husband, terrific choir friends. And wonderful colleagues at the University of South Carolina. As FDR once said, “I’m not the smartest fellow in the world, but I can sure pick smart colleagues.” I agree. It may be sad to bid my beach life adieu, but I’m excited about greeting my colleagues when I return to work on Monday. And if I get too nostalgic about my rowing days at camp, I can look at my hands. There’s a blister or two to remind me that my class schedule might not be so bad, after all. Categories: Uncategorized | Tags: Rowing; Rowing Camp; FDR; Classroom | Permalink.